OTTAWA -- Conservative MP James Bezan wants to see Russian President Vladimir Putin tried at The Hague for war crimes -- and he’s sponsored a parliamentary petition to try to make it happen. 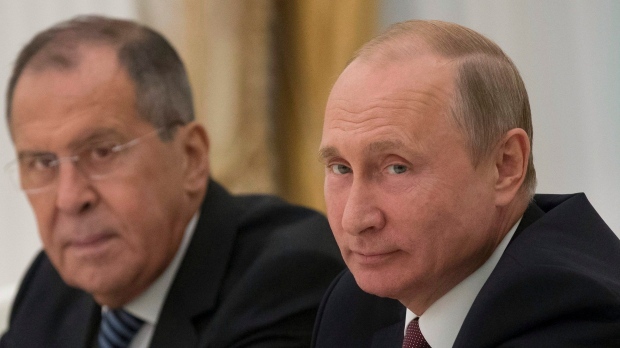 “We, the undersigned, Citizens of Canada, call upon the Government of Canada to declare Putin a War Criminal,” reads the petition, which was published on July 3. Ottawa resident Roman Hruby initiated the petition, which was published on Parliament’s electronic petitions webpage. Petitioners must get a member of Parliament to agree to sponsor their petition before it can become live on the parliamentary website. While MPs are known to sponsor odd or controversial petitions originating in their ridings to make sure their constituents are heard, Bezan represents the Manitoba riding of Selkirk-Interlake-Eastman. Bezan told CTV News he stands behind the potentially provocative petition, despite the fact that there are no other e-petitions on the website right now that use such strong language about the Russian president. Bezan was banned from Russia alongside 12 other lawmakers four years ago. Russian officials said at the time that it was a retaliatory response to Canadian sanctions slapped on Russia over Ukraine. “They of course are always the loudest to scream foul when anyone at all draws attention to their active involvement in the war in Ukraine, when you draw attention to their illegal annexation of Crimea, when you draw attention to their violation of human rights,” he said. The petition went live just 13 days before Putin’s July 16 summit with U.S. President Donald Trump. The timing, Bezan said, wasn’t intentional. “The timing is coincidental, but I think it is, in my opinion, good timing,” Bezan said. The petition, which has amassed 41 signatures in two days, will remain open until Oct. 31. If it gets more than 500 signatures by the time it closes, the government will have 45 days to write and table their official response. “We do need to send a strong message to Putin that the world is watching, that his actions are considered war crimes, and also send a message to world leaders…that we cannot appease a dictator,” Bezan said. For their part, government officials said they intend to respond to the petition. “The Government will provide an official response in due course,” Adam Austen, Freeland’s press secretary, told CTV News. Austen also reiterated Canada’s position on recent Russian aggressions. “We unequivocally condemn the illegal annexation and occupation of Crimea and the violence perpetuated by Russian-backed forces in Eastern Ukraine,” he said. Crimea’s annexation is just one Russian action the petition lists as evidence that Putin should be designated a war criminal. It also alleges the Russian president abetted the bombing of civilians in Crimea, had his regime kill Russian journalists, and commanded armed groups to shoot down the flight MH-17 over Ukraine, killing 298 civilians. Bezan said it’s up to the International Criminal Tribunal to determine whether someone is guilty of a war crime, but believes the evidence against Putin is damning. “I think all too often we’ve been too careful to avoid linking Putin directly to the action of the Russian Federation and their proxies but we all know that there’s only one conductor on this train, or of this orchestra, either way you want to look at it, and that’s President Putin himself,” Bezan said. Seva Gunitsky is a political science professor at the University of Toronto. He said the petition, while interesting, is unlikely to change anything. “It appears to be a largely symbolic measure designed to please a domestic audience, rather than something that might have any real impact on Russian behavior,” he said in an email sent to CTV News. Bill Browder, an American-born businessman and outspoken critic of the Russian president, has been a key advocate of the Magnitsky Act. It was the death of Browder’s lawyer, Sergei Magnitsky, in a Russian jail that spurred the creation of the series of laws, which target the property of corrupt officials. Browder commended Bezan’s sponsorship of the petition. “I think it’s totally appropriate -- everybody should be making the same petitions of other countries and good for him for being a leader in this area,” Browder told CTV News over the phone from London, England. Browder was deported from Moscow, where he ran the successful investment fund Hermitage Capital Management, in 2005. Shortly after being booted from the country, a group of corrupt officials took over his fund and used it to commit tax fraud. Three years later, a lawyer he hired -- Magnitsky -- was put in jail and ultimately died. He has since pushed to punish the officials that he believes are responsible for Magnitsky’s death. “Putin is eventually going to end up in The Hague -- if he doesn’t perish before then,” Browder said. Browder worried what he described as Putin’s control over some players at the international level will help the Russian president evade justice for the time being. However, he said the petition sends an important message. “I think that Putin has been getting a lot of big gifts lately,” Browder said. The Russian Embassy did not respond to multiple requests for comment. However, Russian officials have been outspoken in the past on the issue of Crimea, which they believe to be an inseparable part of Russia. The Republic of Crimea, officially speaking, is a part of Ukraine. Putin has also publicly rejected claims of Russia’s role in the MH-17 plane crash.